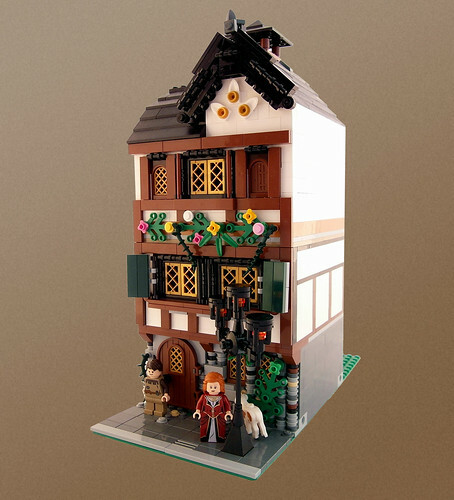 Brick Town Talk: Ye Olde Modular - LEGO Town, Architecture, Building Tips, Inspiration Ideas, and more! Peasant Trail - (BTT) At first glance, it appears that we have traveled back in time. Looking at this building, with its half-timbered facade and stone base, there is surely no doubt that we are looking at a scene straight out of the Middle Ages. Even the owners out front seem to be decked out in period appropriate garb. Turns out that they are just on their way to the local Renaissance Festival, and this building is just a wonderful homage to the era - minus the plague and religious persecution, of course.